In the Friendship Division this year, 12 teams took to the courts for some weekend warrior competition. Following pool play Saturday, the top 8 teams advanced to the Medal Round on Sunday, while the remaining 4 teams competed in the Consolation Round. 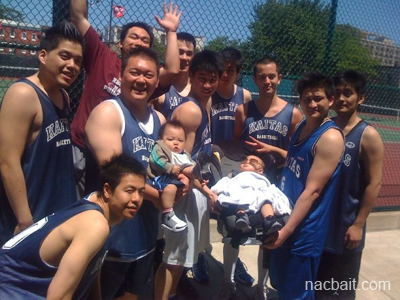 In the Consolation Finals, the Montreal Kaitas OG, led by veteran F Roberto Lin’s 9 points and 5 rebounds, defeated fellow Canadian hoopsters Vancouver NPG 31-27. In the Medal Round Quarters, the tournament favorite NY Rockits Alumni struggled early on, but put away a team of NACBA first timers- the New Jersey Raging Demonz- by a score of 30-24. Kenny Lee had 8 points and 2 blocks for the Rockits, while All-NACBAIT guard Justin Chin had 6 points for the Garden Staters. The next game was NY United East facing the hometown Philly Suns B. Philly’s gameplan was to stop Incredible Hulk body double Leighton Kuet (5 pts, 2 steals) and keep him from dominating the game. Their strategy was pretty decent but then Jerry Lu (7 points, one 3-ball) began hitting from the outside to yield a 2 point halftime cushion for New York. Jerry’s jumpshooting proclivity was matched by Suns rookie Jimmy Huynh (10 pts, 4-4 ft) in the second half, but UE was still up by 7-8 points the whole way. With only a few minutes of clock left, the Suns started to run isolation plays to exploit mismatches and Philly overcame the deficit for a 27-23 win. The 3rd QF game was the best matchup of the round to watch, when the undefeated Toronto Sliders faced the upset minded NY Technicians. The Technicians were more than ready, displaying tremendous teamwork and unselfish play. Toronto countered with a more daring approach to the game, driving to the rack and pulling the trigger a couple deep threes unexpectedly. The game seesawed back and forth with numerous momentum swings. In the end, Rembert Koon’s 12 points gave Toronto a 35-32 win. The final game of the round was over by halftime, with the tough defense of Markham FCCM allowing them to take a double digit lead over the undersized NY Crossbearers B. Markham went on to the Semifinals with a 39-27 win. The first Semifinal game featured two storied organizations- the Philadelphia Suns B and the NY Rockits Alumni. The Rockits began by looking to the hot hand of Charles Zheng (8 pts, 4-4 ft, 2 assists) for some scoring. On the boards, the Rockits were large and in charge, leading NY to an 18-12 halftime edge. In the second half, it was the younger legs of Philly that shifted the momentum. 6-0 forward Tuan Tang (12 pts, 4 offensive rebounds) finally did something to show why everyone believes he has so much potential, rattling down 2 consecutive three-pointers to turn the tide Philly’s way. After that, the Suns got their swagger going, were a step quicker to all the bouncing balls, and started playing with confidence. The Suns advanced 30-28 in a low scoring nail biter. The second Semifinal match was a game between two Toronto area rivals- the Toronto Sliders and Markham FCCM. The Sliders raced to an early lead and held a 7-point lead midway through. But you had to know there was some pride left in Markham. Markham scratched and clawed their way back into it, getting all the loose balls and hitting their open jumpers. But despite being outscored 17-11 in the second half, the Sliders found a way to win 29-28. The Championship game was a déjà vu pool play game between the Philly Suns B and the Toronto Sliders. In the first game, Toronto played a pack ‘em in zone defense and dared the Suns to beat them from the outside. Toronto easily won the Saturday contest, so their thinking had to be “if it ain’t broke, don’t fix it.” Toronto came out in a 2-3 zone once again, and the Suns couldn’t make an outside shot. The halftime score was 30-16 in favor of the Sliders. MVP Rembert Koon sent Philadelphia home early in the game, sinking 3 of 4 three’s in the first half. Throw in some needless turnovers with no Toronto defense challenging the play, and that’s all anyone needs to know about this game. Philly was able to make the score respectable in the second half, but it was really all Toronto as they won 47-36. 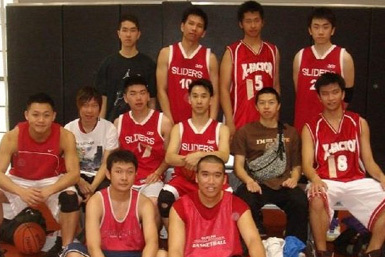 Tuan Tang led Philadelphia with 10 points and his teammate Wai Wai Fung scored 9. Congratulations to the Sliders.